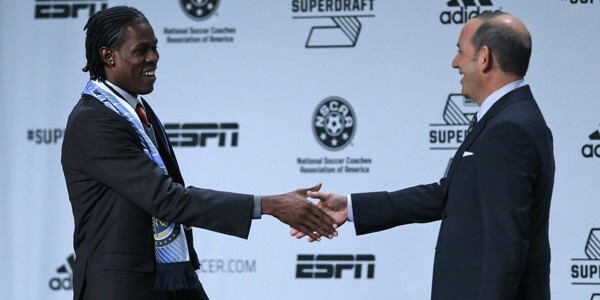 There were three Jamaicans in the top 10 picks of the first round in the 2014 Major League Soccer (MLS) SuperDraft last week: Andre Blake, Andre Lewis and Damion Lowe. 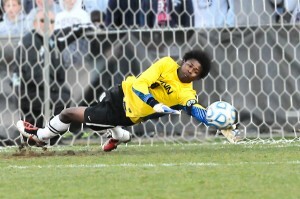 If that isn’t enough, Andre Blake was selected as the first pick of the SuperDraft by the Philadelphia Union. He became the first goalkeeper to be top overall choice in the Draft. All three of these guys were born and bred in Jamaica and are ready to take American football by storm. We run the rule over each one of them. Andre Blake stands on stage, Philadelphia scarf wrapped around him, hands in pockets and engulfed in a dream bubble. He’s just been announced the very first pick of the SuperDraft. That in itself is an incredible achievement. But to be the first goalkeeper to do so is even more incredible. Asked he it feels to be named the first overall pick, Blake sighs before replying: “I mean words can’t explain right now how I’m feeling. First of all I want to say I’m a firm believer of God so I just want to say thanks to God right now. Thanks to MLS and Generation Adidas for believing in me and giving me the opportunity.” His words are humble and heartfelt. This is clearly an affable guy whose own hard graft and faith has propelled him to where he is now. You can’t help but admire. He was destined to be a top level goalkeeper. Positive comments are coming in thick and fast for Blake, who made an outstanding impression at the MLS Combine in Florida. Athletic, vocal and a competent shot stopper – the 23-year-old excelled and was by far one of the key performers. It was blindingly obvious that this was no ordinary goalkeeper. One of the main aspects of Blake’s game is his positioning and authority in the box. Crosses will be whipped in and he’ll be the first to run out and claim the ball. 9 times out of 10, he catches it and relieves the pressure on the defence. Blake himself describes his style of play as “fun to watch” and that he tries “to make everything simple”. Jamaica’s No.1 Donovan Ricketts – a member of Portland Timbers and reigning MLS Goalkeeper of the Year – will be cautiously looking over his shoulder. Blake looks up to him as a role model. “He’s [Ricketts] a guy I look up to. I remember when I was with the [Jamaica] U-20s and he came back from England and that was the first time I came in touch with him and he came to a practice. I felt honored to practice with that guy,” he says. “I really look up to him.” Indeed, Blake has been a prominent member of all Jamaica’s youth squads and recently he was called up to the seniors for Hexagonal World Cup qualifiers. Now the qualifying campaign for Brazil is over, The Reggae Boyz are setting their sights on Russia 2018 by which time Blake will be aged 27. Ricketts will be past his prime and Blake will be at the peak of his career. Without question, he is Jamaica’s future No.1. Blake is starting off as a MLS rookie but evidently has all the ingredients to learn quickly and make a genuine name for himself at Philadelphia. The support he has is immense and a lot of people already know about him through his SuperDraft exploits. With his club and national prospects looking very bright indeed, there’s no hindering Andre Blake’s ascent up the footballing ladder. They are bold words but obviously Lewis is extremely well regarded. He began his career at Portmore United in Jamaica before making the jump to College level with St. George’s. At the same time, he was beginning to make a mark on the youth international scene. As a slight 16-year-old, Lewis operated the right wing for the Under-17 team which qualified for the Under-17 World Cup in Mexico in 2011. For large parts of the tournament, Jamaica were bereft of any offensive threat. Lewis provided a creative spark and scored in the final group game against France in a historic 1-1 draw. For such a small and slender player, Lewis boasts surprising good upper body strength and is tenacious in the tackle. He was also picked to travel with the Under-20s for the CONCACAF U20 Championship last year. 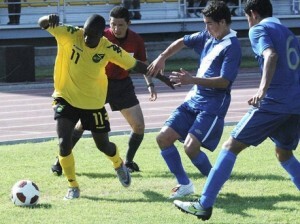 The Jamaicans battled well and reached the quarter-finals only to suffer a pounding by, ironically, Mexico. In late 2012, Lewis received his much-anticipated call-up to the full seniors. Lewis was the No.7 pick in the SuperDraft and joined Vancouver Whitecaps, who were in need of a creative attacking midfielder. He was the first international player and first non-collegiate player taken which speaks volumes about his ability. However, his signing with the Whitecaps wasn’t as straightforward as it should have been. In fact, it was wholly controversial. Lewis had actually penned a deal with the second tier side New York Cosmos prior to his selection by the Whitecaps at the SuperDraft. Contractual confusion aside, Lewis should prove a massive hit in US football. It is imperative that he keeps his feet on the ground, continues to keep working hard in training and the rich rewards will follow. Jamaica have a fine young talent on their hands. Lowe describes himself as “pretty much aggressive on the field”, but “humble” off it. 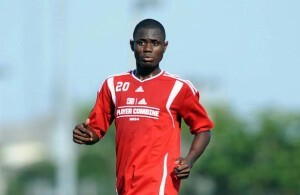 Invited to the MLS Combine after three successful seasons at the University of Hartford (UH) in the United States, Lowe played youth football for top Jamaican club Harbour View. He attended Camperdown High School in Kingston before switching to UH. 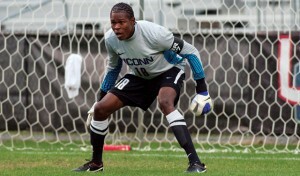 At UH, he flourished and was called up to the same Jamaican Under-20 team which featured Andre Lewis. He scored in the 1-4 hammering of Puerto Rico in the CONCACAF Championship last year and has high hopes for pulling on the senior shirt. Lowe has persevered and shown great dedication to become a professional within the game. “It’s a dream come true,” he beams. “As a kid I always wanted to play professional soccer. It’s awesome, it’s a great feeling.” And playing on the big stage in front of thousands of people doesn’t seem to bother him, either: “When I was playing for the [Jamaica] U20s in Mexico, there was like 50,000 [spectators]. So I’m kind of used to that right now. I like the environment that Seattle has to bring to the players and I’m looking forward to that.” He speaks with such confidence and swagger, that you forget this is just a 20-year-old guy speaking in front of the cameras. He says he is a “warrior on and off the field” and his formidable strength and unquenchable thirst for progression bodes well for the Jamaica national team heading into the future. Alvas Powell is another very promising young Jamaican centre half – he’s just 19 – who is on loan at Portland Timbers in the MLS from Portmore United. Lowe is close with him and Powell-Lowe as a central defensive combination is an exciting prospect. Without question, Damion Lowe is a name worth remembering. So what does this actually mean for Jamaican football? It’s certainly a massive boost and it is no fluke that three players hailing from Jamaica were included in the top 10 picks. There are increasingly more Jamaicans transferring to the MLS. Local clubs on the island have profited from elite MLS teams buying local, homegrown talent. Instead of moving to the likes of Europe, they’re choosing America and Canada instead. When you think about it, the fact Jamaica has been able to produce and hone so many competent footballers who have switched to the MLS is really quite remarkable. The country has had to rely on its high schools to steer youngsters in the right direction. There are no luxurious, expansive academies. From high school, some (the very best) are cherry-picked and awarded scholarships to universities but the vast majority rot away and give up on the game. It’s a significant point and until words are turned into actions, this is an ongoing cycle. Blake, Lewis and Damion are prime examples of young Jamaican footballers (born and bred on the island, nurtured via youth clubs in Jamaica) that have benefited from the attention shown to them from an early age. Their natural talent has helped hugely but also via exposure, experience and effective advice. 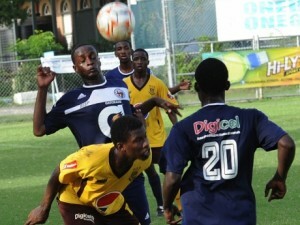 Jamaican football is bursting with potential and exciting, raw youngsters. It’s about harnessing their abilities and constructing a sound national programme in which to work in that is truly essential for development and indeed enhancing the base of football in Jamaica.